MultiSync® V801 is the flag ship model of NEC V Series. The display boasts over 200 cm diagonally in size making it the ideal product for installations which require sheer size and appearance. 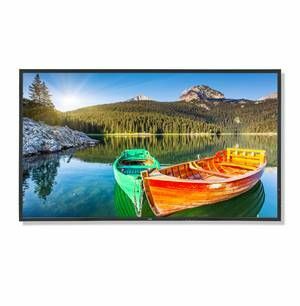 The Edge LED backlight technology secures a slim design and amazing low power consumption levels. As all other V Series Displays, V801 comes with a programmable ambient light sensor which can help to further reduce power consumption. The OPS slot allows for the integration of slot-in PCs, HDSDI and other OPS based devices providing a unique flexibility in the 80" class product range.Ideal for attention grabbing retail signage or other size requiring installations up to 16/7 operating time and front projector replacement in meeting rooms.